The NES spawned numerous long running, successful game series. Even if you discount Nintendo’s own evergreen collection of titles, there are still quite a few with a continuous presence in the gaming mind share. Though they are not the draws they once were, Mega Man, Contra and Castlevania have had releases in every console generation. Ninja Gaiden was as big a draw as any of those series on the NES, but after a quick port/remake on the SNES, it disappeared completely for nearly fifteen years. Its return on the Xbox is really only debatably a part of the same series. 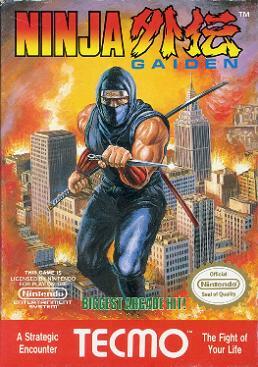 It is sad there was never a true 16-bit Ninja Gaiden (Sega’s Shinobi is a poor substitute), but I would guess its disappearance is mostly due to lack of interest in the unchanging games. Still, Ninja Gaiden is the best ninja related game on the NES. Ninja Gaiden is not a complex game. It is very similar to Castlevania; you jump, attack, and do special attacks with up and the attack button. The levels are linear with bosses at the end. The big difference between this and Castlevania is Ryu, the main character. As a ninja, it would not make sense for him to move with Simon Belmont’s arthritic gait. Ryu has many acrobatic ninja skills, like wall climbing and jumping. It is the quintessential NES action game. Ninja Gaiden is not mind-blowing, but it is a very good, even great action adventure. Many games play like Ninja Gaiden, but very few that play better. The thing most remembered about Ninja Gaiden is its difficulty. The game is hard. Some might say NES hard. While the player does, has a decent sized life bar, the hits come frequently from the also frequent and occasionally cheaply spawning enemies. The enemies spawn when you pass a certain threshold, so if you get hit and knocked backwards it could cause an enemy you already killed to re-spawn. This is not different form most NES games, but how quickly the enemies spawn does make the game rough. It also introduced gamers to the ninja’s one true enemy. Not pirates, as internet morons would have you believe, but birds. Spawning ceaselessly, the avian menaces seem to delight into knocking ninja’s into pits. Not matter how skilled the ninja, there is no way to avoid their attacks, unless, of course, the ninja has foreknowledge of their place. Also, just to spite the players, if you get to the last Act and say lose to the last bass, be prepared to play each of Act’s stages over. It is cruel and hard and the reason why sane players think the game ends when you see the castle. The other thing Ninja Gaiden was known for is its cinematic stylings. For an NES game, Ninja Gaiden has a remarkably coherent and prominent story. Between each level, the player sees scenes of Ryu sorting out exactly what happened to his father. It is not a particularly great story, but compared to other NES games it may as well have been Shakespeare. Most NES games’ stories were confined to their possibly insanely translated manuals. Conflicting or downright nonsensical elements were frequent. However, Ninja Gaiden has a simple, effectively told story. Sure, it has crazy ninja magic, but of course, it has crazy ninja magic. While this focus is not something to marvel at now, at the time it really separated Ninja Gaiden from its competitors. Even with its punishing difficulty, Ninja Gaiden is a great game. The story gives it something unique to cling to and it plays as well as any NES action game. Once the player learns the locations of some of the enemies, the game does get easier. One must only remember that death is not failure, it is merely an excuse to try again.